Matt Sussis is the assistant director of communications at the Center for Immigration Studies. In April 2018, the Trump administration implemented new guidelines as part of its "zero tolerance" policy toward illegal entry, in response to the rising number of illegal aliens showing up with their children at the southern border. Under these guidelines, the Justice Department prosecuted every border infiltrator for the crime of entry without inspection. After detaining the parents, the government could either put the children in a shelter (due to legal prohibitions on keeping children in detention for over 20 days), or release the entire family into the interior of the country — "catch-and-release" — and hope that they don't simply disappear into the illegal immigrant population. The first of these two options has been decried by critics as one of "family separation". To understand how this conundrum arose, one must learn the history of the Flores settlement agreement. Digging into its history bolsters the theory that the Clinton administration was well aware of what it was doing when it signed the agreement, and may have shared more in common with the activist plaintiffs than originally thought with regard to loosening the rules governing asylum. The consequences of the Flores settlement, a 1997 agreement between immigration activist groups and the government, have been central to the debates over President Trump's "zero-tolerance" policy at the border and accusations of family separations. A full understanding of this agreement requires understanding its history. Beginning in 1985, the activist groups began a series of lawsuits against the federal government over its perceived mistreatment of alien minors in detention facilities (notably a 15-year-old Salvadoran girl named Jenny Flores), culminating in a consent decree, the Flores settlement, more than a decade later. This 1997 settlement led to the government agreeing to set immigration detention standards for unaccompanied alien children (UACs), particularly regarding facility conditions and the timing and terms of the UACs' release. When the government entered into the Flores settlement agreement, its stated intention was to finally resolve years of litigation against the INS, but this is only partially true. Recent comments and actions by Clinton administration officials indicate that they were at least partially motivated by a desire to cooperate with the activist plaintiffs to loosen asylum rules. Since 1997, Flores has been significantly expanded upon by federal judges with loose border proclivities, and is now interpreted to mean that all minors in detention — accompanied by their parents or not — cannot be held for more than 20 days. 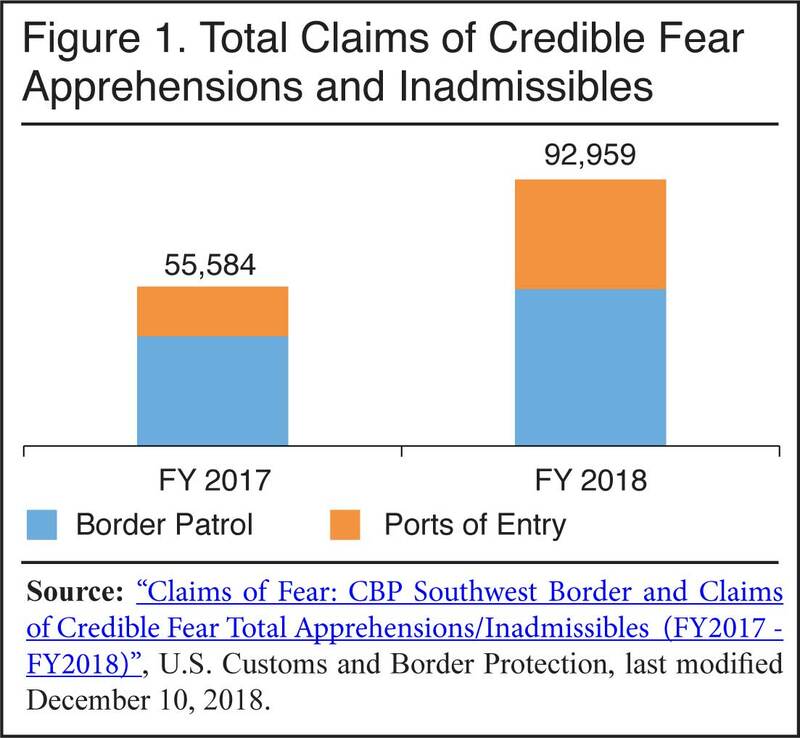 Partially driven by Flores, the number of apprehended aliens who claim credible fear (the first step in applying for asylum) has soared — up 67 percent in FY 18 vs. FY 17, and up over 10-fold from a decade ago. Moreover, only 3.5 percent of UACs are ever removed, according to DHS. Congress could pass a law superseding Flores, but has yet to do so. The immigration laws and regulations of the United States were administered by the Immigration and Naturalization Service (INS) before Congress passed the Homeland Security Act of 2002 and President George W. Bush transferred that agency's responsibilities to what are now three agencies — U.S. Citizenship and Immigration Services (USCIS), U.S. Immigration and Customs Enforcement (ICE), and U.S. Customs and Border Protection (CBP), each located in the Department of Homeland Security. It was during the time that INS had jurisdiction over immigration that Carlos Holguin, an immigration lawyer in Los Angeles, received a call from a Hollywood actor about that actor's housekeeper, an illegal Salvadoran immigrant.1 Her daughter, Jenny Flores, was being detained by INS. Jenny's mother didn't want to pick her up, as she feared bringing herself before INS would result in her deportation. INS would not release Flores to her cousins — they said that only legal guardians, for the sake of the child's safety, could pick her up. Jenny Flores later alleged that the conditions of her detention were substandard. The lawsuit sought to establish standards for how INS handles detained minors, and specifically expressed concerns that Jenny Flores was strip-searched, that she shared living quarters and bathrooms with male adults, and that she couldn't be released to non-guardian relatives. This victory for the INS was short-lived. One year later, the Ninth Circuit en banc (a full 11-judge court) reversed its prior ruling, and in a 7-4 decision affirmed Judge Kelleher's 1988 ruling. On October 13, 1992, the Supreme Court began to hear oral arguments in the case. A year later, the Supreme Court delivered a significant win to the government, voting 7-2 in favor of reversing the lower court's decision. Justices Scalia, Rehnquist, White, O'Connor, Kennedy, Souter, and Thomas all held that there was no constitutional right for unaccompanied alien children to be released to someone other than a close relative, and further held that these minors could be kept in detention centers if they lacked a close relative or guardian in the United States to take them in.5 Scalia wrote: "Where the Government does not intend to punish the child, and where the conditions of Governmental custody are decent and humane, such custody surely does not violate the Constitution." The government would release children "without unnecessary delay" to (in order of preference) the children's parents, legal guardians, other adult relatives, or another individual designated by the parents/guardians. The government would put children in the "least restrictive" setting appropriate. That settlement laid the groundwork for the current asylum crisis at the border and extends well beyond its initial mandate. Why Did the Government Sign Flores? Why, just a few years after a sweeping Supreme Court victory, did the Clinton administration agree to the Flores settlement? The stated reason was that the government was looking to finally put an end to over a decade of litigation that began in 1985, and certainly there may be some truth to that. The settlement, however, seemed like a major concession by the winning side, and certainly one that could (and later did) crack the door open further for open-borders groups to exploit asylum laws for minors. Well, so here is the situation. What — the reference that they're making is to a court settlement called the Flores decision, which took place in 1997. I'm very familiar with it because I signed it. And it was a settlement of a long-standing piece of litigation that said that children would be detained in the least restrictive setting possible and for the shortest period of time in order to be placed with either a family member or another care situation. That law — that — and that's not a law. It's a court settlement, but it has the force of law. And it has been expanded by another court judgment just a few years ago to apply both to children and to families with children. So it is valid to say that it has the force of law. It is not actually a law. It would have — to change it would require legislation, which is what the Congress is talking about. However, it is a judgment on the part of the administration how to implement that court decision. And this implementation of the court decision that says children need to be separated from their parents because their parent is being prosecuted — that has never happened before in the past from the time that this settlement took place through other administrations — both Democratic and Republican administrations. Meissner appears to be making a new admission here: Her decision to sign Flores was guided by humanitarian considerations for the children, rather than simply a concern about the risks of further litigation. There's nothing inherently wrong with that, of course, but it is curious that the 1997 defendant — the INS — didn't appear to think of detention reform much differently than did the activist plaintiffs. And, if the then-INS believed that these changes were necessary, it could have simply made them itself, without binding future administrations to its policies. Certainly, President Clinton, Meissner, and Virtue (among others who supported the agreement at the time) could not have predicted the ways in which Flores would be even further contorted in the years to come. Nonetheless, Occam's razor states that the simplest answer tends to be the correct one. The simplest explanation for the actions of the Clinton administration around the signing of Flores in 1997 is that it held the same views on asylum laws that the activist groups did — namely, that they ought to be looser. In 2003, as part of a major government re-organization following the 9/11 terrorist attacks, Congress abolished the INS, and transferred its responsibilities to several entities within the Department of Homeland Security. The responsibility for transferring alien minors to their parents, however, was shifted to the Department of Health and Human Services, with the Office of Refugee Resettlement handling both care and custody of unaccompanied children. Meanwhile, activists continued to allege that the terms of Flores were not being fully met by DHS/HHS. In 2008, Congress passed the Trafficking Victims Protection Reauthorization Act (TVPRA), which codified parts of Flores into federal law in what are called "savings clauses", preserving certain rights for alien children. The next major change to Flores, and almost certainly the most significant, came in 2015. An Obama-appointed federal district court judge in California, Dolly Gee, ordered that the Obama administration must release detained children and their mothers who were caught crossing the border illegally, saying that detention centers in Texas had failed to meet the Flores standards. In fact, Judge Gee even went a step further. Flores calls on the government to release children "without unnecessary delay". Gee interpreted that to mean 20 days. In other words, now all minors in detention, whether or not they were with their parents, couldn't be detained for more than three weeks. This ruling laid the groundwork for the current crisis at the border, in which children are released while their parents can still be detained awaiting hearings — hence, the "separation" of families. The alternative is simply releasing the entire family after three weeks or less. In other words, "catch-and-release". Aliens respond to incentives, and Flores remains a strong one. After all, if a Central American mother knows that bringing her child means that she can simply show up at a port of entry, claim credible fear, and then quickly be released from detention into the country regardless of the actual validity of her asylum claim, why wouldn't she do so? There have been discussions in Congress about passing a law that would supersede Flores and finally settle the issue. Several Republicans, mostly notably Ted Cruz (R-Texas), called on Congress to fix Flores in order to resolve the related issue of child-parent separations and catch-and-release. As of early 2019, however, such a fix has yet to pass Congress, and doesn't look likely to any time soon. 1 See "The History Of The Flores Settlement And Its Effects On Immigration", NPR, June 22, 2018. 2 See the websites for The Center for Human Rights and Constitutional Law, the National Center for Youth Law, and the law offices of Streich Lang, which has since merged to become Quarles & Brady LLC. 3 Flores v. Meese, 681 F. Supp. 665 (C.D. Cal. 1988). 4 Flores v. Meese (1990). 5 See Linda Greenhouse, "Detention Upheld on Alien Children", The New York Times, March 24, 1993. 6 "Slipping Through the Cracks: Unaccompanied Children Detained by the U.S. Immigration and Naturalization Service", Human Rights Watch Children's Rights Project, April 1997. 8 "Barbershop: Border Separations", All Things Considered, NPR, June 16, 2018. 9 Paul Virtue 1998 memorandum. 10 See Julia Preston, "Judge Orders Release of Immigrant Children Detained by U.S." , The New York Times, July 25, 2015. 11 Flores v. Lynch (2016).